With midterms gone and spring break air finally filling my nostrils, I sped (not too fast) down I-95, home to NYC. The boys, parading a blue and grey marked car, started to tail me. Of course, I began the ever lasting under 65mph snail-trail with the rest of traffic and continuously checked my side view. Still, they tailed me, without flashing lights or probable cause. Perhaps they're just going the same way as I am? Right? After 20 minutes of tailing me and switching lanes, their lights went off. Yes, I was being pulled over. However, that's not what bothered me. What bothered me was the fact that they came to the right side of the car, intimidating my passenger. What bothered me was the cynical smirk he wore when he realized we we're two young black woman driving a nicer car than he probably owned. Was it drug-dealer or rich drug-dealer boyfriend that first crossed his mind? Perhaps the partner who stuck his head in at the SAME exact time had the thought? 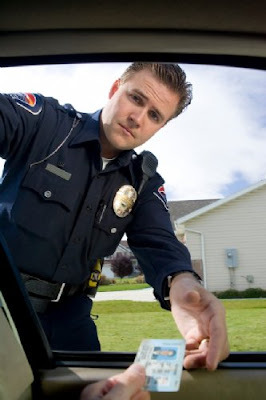 His greedy hands snatched the licence and registration and searched hopelessly for a problem. Ouch, paper-cut, I could sue him for that. Why am I being pulled over? Ma'am sometimes people look suspicious and you were driving a bit slower than everyone else, so we pulled you over. You're the boys....EVERYONE slows down when you guys come around.
. But what was he to do? Write me a ticket for having a smart mouth? Ehhhh. No. Let's make sure we have this correct. Young black girl driving a nice car. SUSPICIOUS. Driving within the speed limit. SUSPICIOUS. So, why do I feel so bare? You feel naked because he stripped you of your dignity trying to make you ashamed of the skin that is you, a black intelligent woman who wears a crown of royalty. Police thrive off intimidation. Don't ever give them a reason and they'll still mess with you.